Microcurrent is known to be the one of the most effective non-surgical method to take years off the face. My treatments take the efficacy of microcurrent to a new level by being able to pair it with Radio Frequency Thermal Lifting,also a cutting edge non-surgical treatment. This combination provides dramatic results. However, they are both great as a stand alone treatmentl. These treatments are very relaxing and most people fall asleep during the procedure. 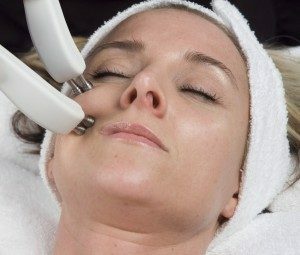 The Micro Current Treatment has been touted to be “the single most powerful tool for skin therapists.” Not all microcurrent equipment is created equally. The ability of microcurrent to positively effect the tissue and the results that are achieved are completely dependent on not only the sophistication and engineering of the machine, but also on expert application by a trained practitioner. We first need to understand what causes our facial skin to wrinkle and sag. As we age, our muscles become accustomed to certain expressions and tend to get stuck in these positions. A great example of this is the furrow between the eyebrows that many people get. At the same time, other muscles in our face are hardly ever used, and they begin to atrophy, which leads to sagging. An example of this can often be seen around our jaw lines, chins and necks where we tend to develop sagging or loss of definition as we get older. As we age, skin cells become less active, which leads to a breakdown of collagen and elastin. By the age of 45, the upper cheek muscles may elongate by as much as half an inch, dragging the skin over the cheeks downward to form plump little pouches at the corners of the mouth. The muscles under the chin become loose and the jaw line loses its firm contour.